Sometimes, good deeds do not unpunished go. "Dear Srajan, I've been reading your site and noticed that you published a nice shot of our limited edition monoblock when you published news of our impending move back in August. Now that we've got the move done (what a project that was) and our backlog caught up... do you have a personal interest in tube products (which is more polite than asking if you are a tube head)? 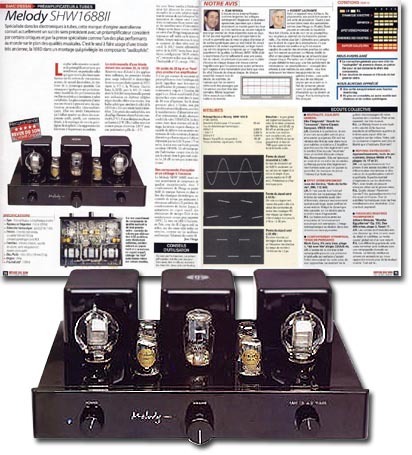 And, would your site like to be the first to review our tube amplifiers? Cheers, Carolyn Koh". Those who know me know how I responded to that one. This came next. "Introducing you to another tube aficionado then. 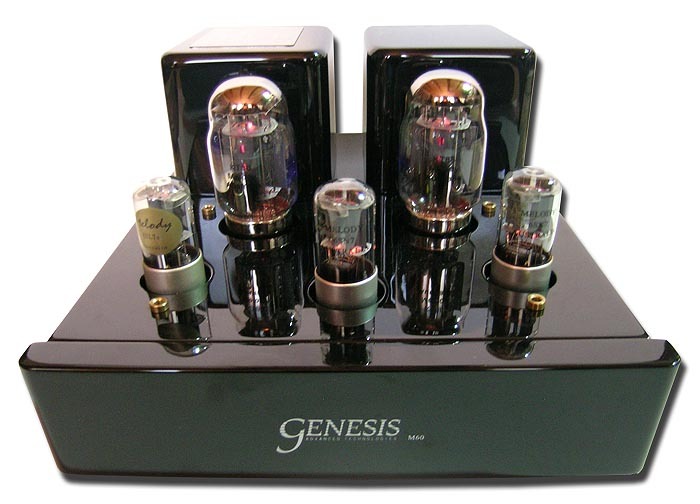 Please meet Gary Leonard Koh, CEO of Genesis Advanced Technologies who personally oversaw the development of these tube amps and specified the tubes to be used. The MSRPs are: $3,495 for the integrated amp, $3,995/pr for the monoblocks." Now things got into high gear and I signed up for the monoblocks (I50 and M50 precursors below). can let you review it but if you need a preamp to use with the monoblocks, I can send that along. Cheers, Gary." "I first came across Melody in early 2003 during a visit China. I was hosted by my Chinese Genesis distributor. As part of the visit, he arranged interviews with Chinese audio magazines. In China, no serious discussion starts until towards the end of the meeting so over lunch, I was chatting with these reviewers and getting to know them. One of the questions I asked was who they thought the best Chinese designer of HiFi gear was. I thought it would be Shanling but two of three mentioned a Mr. Wang and his Melody Valve company. So by the end of that week, we had tracked down the factory, visited and got hold of one of their amps. It was an ugly little beast but it sure sounded beautiful. At that time, my distributor in China was Mr. Pu (Mark Schifter's friend and eventual partner) and that little amp eventually became the Onix H34. It was so good that we use it as our real world reference in our development lab. Here's a picture of it sitting on a pair of Audio Research Reference 600s, Arnie Nudell's reference amps when he is doing his development work. Unfortunately, at 45 watts, the Melody amp was just unable to drive the Genesis loudspeakers to any realistic levels. drive them well would be a $10K amplifier. Or, they would have only a $10K budget and fall in love with the $6K G6.1e. Again, the only amplifier that would drive them properly would be something in the range of $8K. 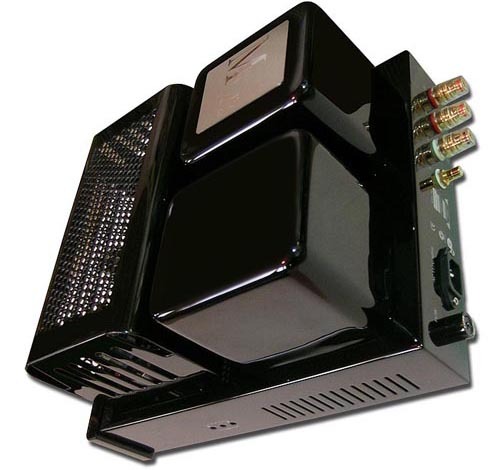 In order to help my dealers sell loudspeakers, I started working with Mr. Wang to develop an amplifier that would retail for under $4K and would be 'good enough' to be the entry-level amplifier for a customer to get into the Genesis Absolute Fidelity sound. Arnie is notorious for saying that he designs the best loudspeakers in the world. Then you'd better have the best amps in the world behind 'em. You simply can't put 85 octane gas into a Ferrari! Anyway, we started with a design that Mr. Wang already had, then worked on the looks as well the sound. It took many, many trips to China over the last two years but we now have a $3.5K integrated and a $4K pair of monoblocks with which to sell Genesis speakers. Mr. Wang has since incorporated a lot of what we worked on together for the rest of his line but that was an expected cultural benefit for Melody. Cheers, Gary." 24 hours later, Gary had successfully communed with Mr. Wang and obtained permission to have me formally review the preamp. But enough already about the pre. 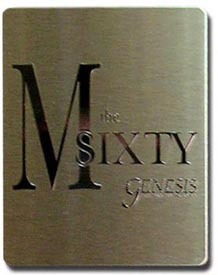 Today's review is about the Genesis co-authored Melody 60-watt KT88 monoblocks. Those must be endowed with unusual cojones. After all, a mere 15-watt advantage over the Onix H34 by itself wouldn't suddenly allow the amp "to drive Genesis loudspeakers to any realistic levels". Did Gary have anything further to share on the M60s' design? All this resulted in the I50 and M50 which we launched at CES last year and which are similar to the Melody H88 [right] and S88 (because they use KT88s). Then, Arnie Nudell and Bascom King got their hands on the prototypes and had even more suggestions. We changed tubes and tried a number of different capacitor types and even resistors. In the last 6 months, we even had custom tubes made by ShuGang (a tube factory in China) before finally getting the first production batch of the I60 and M60. Two final upgrades are done in our own factory, resulting in the Genesis I60 and M60. When we were doing the look of the amp, we just sat at lunch one day and drew sketches on paper napkins. I remember though that Melody wanted to continue with the industrial grey finish they had the SP3 and H34 in. About that time, I was launching the G501 in high gloss piano black and the G201 in acrylic black was under development. I wanted something to match and we worked on the new line being the same finish - black lacquer. What I always tell people is that I don't care how many watts the amplifier has. The most important watt is the first. With speakers of our efficiency, the first watt already gives you 89dB which is plenty loud. Normal loud listening level is about 98dB - which only requires 8 watts. One big factor that gave both the M60 and also the I60 the headroom to 'push harder' was improvements in the output transformer - the single most important component in any tube amplifier. The circuit itself is classic and could have come out of a 60's textbook. The other things we worked on was the power supply. The M60 has a hand-wound power transformer that is almost twice the weight of the H34. Most of which is made of copper rather than just increasing the size of the core. We tried both the 'audiophile preferred' toroidal as well as the normal brick-type. The toroid was sweeter (not needed in a tube amp) but the brick was much more dynamic and ballsy. 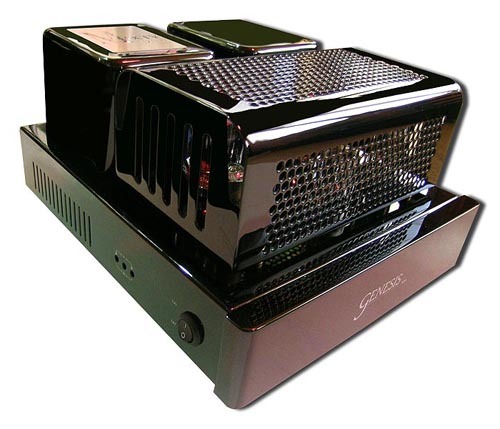 That is why the M60 is twice the cojones of the I60 - a pair of monoblocks having two power supplies as opposed to the one in the integrated." 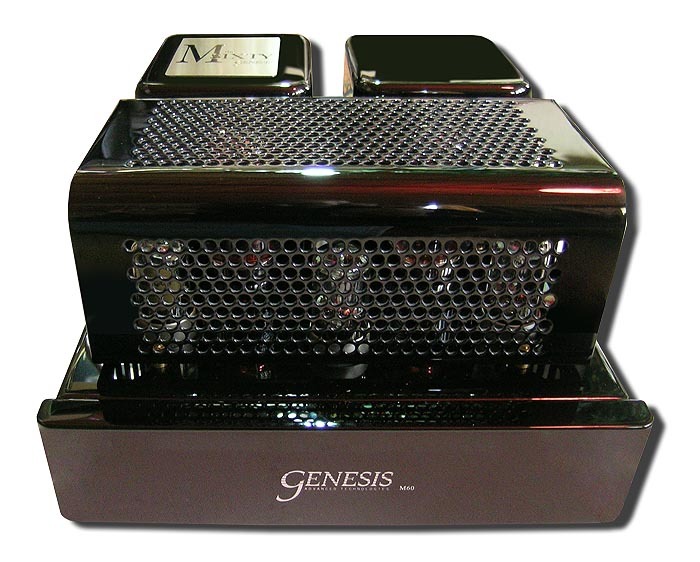 The Genesis monos act like high-gloss miniature Steinways in how their deep lustrous lacquers mirror the light. 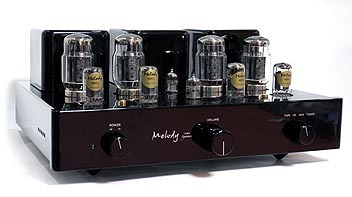 Each M60 "uses a single 6SL7/5691 as an input stage in the standard mu-follower configuration, with 6SN7s in the driver stage for the hand-matched pair of KT88 power tubes. No ordinary 6SN7s for the M60 however - military specs 6N8Ps are selected for their reliability and durability, then hand-picked for linearity and low noise." "While the M60 was developed as a value-priced product, quality has not been scaled down. 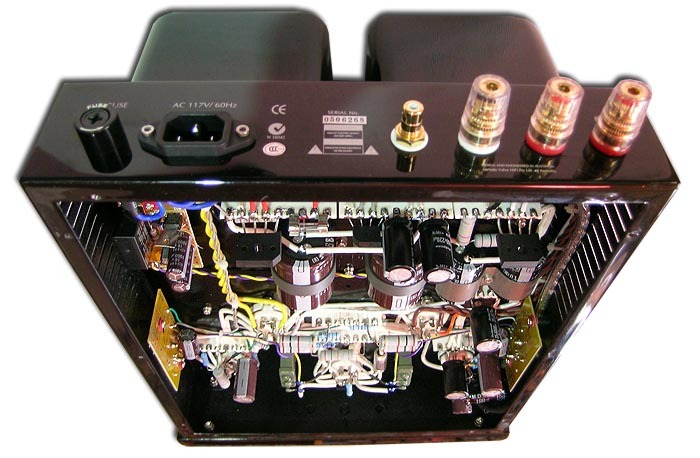 Custom-made military-spec paper-in-oil capacitors with aluminum cans are selected and low-noise gold-plated military-spec ceramic tube sockets are used throughout." To adjust bias current on the output tubes (which isn't an anywhere near regular expected occurrence), side-mounted access points on either cheek allow access for the two leads of a multi meter and a central screw for a flat-blade driver. With the speakers connected but no input signal fed, proper bias should read 2V. 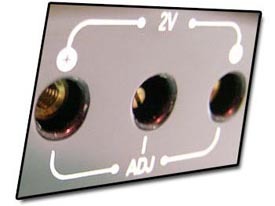 Input impedance is 250kOhm and output taps for 4- and 8-ohm secondaries are provided. Dimensions are 7.25" H x 17" W x 15" D. Weight is a substantial 38 lbs and the perforated tube cage slips off easily on its integral banana sockets. The power switch is conveniently located on the left right behind the thick fascia with the silk-screened white Genesis logo. Three substantial soft-nosed metal footers support the M60 with the single cone upfront. The extremely tidy point-to-point wired innards, the immaculate lacquers and the mechanically silent transformer operation all indicate very high quality indeed. That's not entirely surprising when you consider that Gary Koh had already retired from a highly successful business life to turn gentleman vintner in Australia. 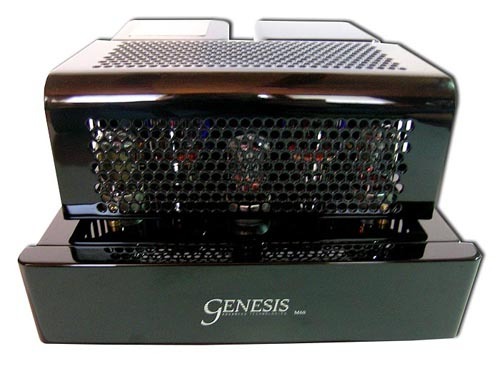 A huge dedicated sound room awaited large Genesis speaker when Gary learned that the company had folded. Early retirement did not sit well with him so he decided to revive Genesis. As the CEO of the reformed Genesis Advanced Technologies, he's "back to working 14 hours a day and loving every minute of it." fierce determination and can-do drive for excellence? That would make neither sense, be in character nor offer any real rewards - the satisfaction of a job well done. 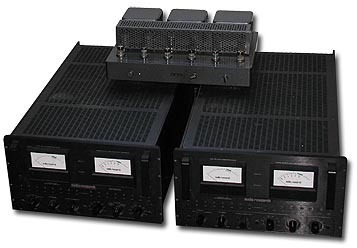 Accordingly, nothing about these amplifiers suggests anything of compromise. This impression begins with the packaging and continues on to the fact that the amps ship with the tubes installed, each surrounded by a sturdy foam ring, then topped off with a foam cover wedged inside the tube cage. Clearly, to gain the plaque on its transformer cover, rather stringent standards and expectations had to be met for this amp design to share the illustrious brand name with the established loudspeakers. This then isn't some mere me-too product just to have in the catalogue for an additional SKU.